... He is the Creator who made everything and still holds it together. He is involved right now in His world. ... God wants to be our Father. This was His purpose in creating man -- to have a family He could love and who could love Him in return. in accordance with His pleasure and will. ... God the Father is changeless and trustworthy. He loves us with an everlasting love. When we become His children we are safe. He will never fail us or forsake us. ... God created heaven as a beautiful home where He and His children could live together forever in peace. ...God's beautiful plans for men were spoiled by the entrance of sin and shame. Sin began with the pride and rebellion of some of the angels of God. They were thrown out of heaven and became Satan and the evil spirits. ...Sin and shame came upon man when Satan tempted Adam and Eve, the first people. Because of their pride and rebellion they disobeyed God's command. They chose to obey Satan instead of God. all must go to hell. ...Sin is the result of falling to temptation like Adam and Eve did. It is disobeying and displeasing God. We sin when we do what we know we shouldn't do. We also sin when we don't do what we should do. and doesn't do it, sins." ...God the Father was not willing that we should all die and go to hell. His plan was to send His Son Jesus to die in our place. Jesus is the only One who could be our substitute because He is the only One who is sinless and so has no sins for which He must die. He could die instead of us. ... Jesus, who is Himself God, was willing to be born as a baby, live on earth, suffer and die on the cross for our sake to fulfill the Father's plan. The Father's plan was to bring us lost sinners back into His family. not counting men's sins against them." 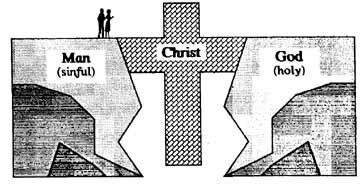 ... Christ's death on the cross totally defeated all evil powers -- Satan, evil spirits, and death. His shed blood provides cleansing from sin and power over evil. ... Jesus rose, from the dead proving His victory over Satan. He ascended to heaven and is now at the Father's right hand praying for us. because He lives to intercede for them. ... There are not many ways to God as some people think. There is only one way -- the way God has chosen: His own Son! ... Although Christ died for the whole world, this doesn't mean that everyone in the world is automatically saved. If we want to be children of God we must each be born individually into His family. ... 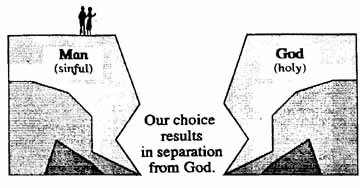 Since our sin separates us from God, we must first repent of our sin. Repentance means not only feeling sorry for our sin, but also humbling ourselves before God and then turning from our sin. ...Then we must confess all our sins to God and ask Him to forgive them. Only God can forgive sins against Him. ... Next we need to have faith. Faith is believing that God hears my prayer and forgives all my sins; that when I ask Jesus to come into my life as Lord and Savior, that He does; that when God says He will make me His child, He really does. ... We need to turn our whole lives over to Christ, making a complete commitment to Him and asking Him to be our Lord and Savior. At the same time, we need to renounce any connection from the past with evil spirits, magic, and witchcraft, claiming the cleansing and protecting power of Jesus' blood. Here is a sample prayer you can pray. This is not a magic prayer. It is only a guideline on "confessing" that you believe and want to receive Jesus Christ as your Savior and Lord. Dear Lord Jesus, I know that I am a sinner and need Your forgiveness. I believe that You died for my sins. I want to turn now from all my sins and any connections with evil from the past. Please forgive me and wash me clean with Your blood. I now humbly ask You to come into my heart and life and be my Lord and Master. I give my life totally into Your hands. Thank You for Your mercy to me, and for making me a child of the Father. What difference does this decision make in our lives? ...We enjoy the freedom of having our sins cleansed away and no longer being under Satan's control We must sha-re this good news with others so that they, too, can experience this freedom from sin and Satan. ... We become members of God's family with Him as our Father, Jesus as our Savior, and all other true Christians as our family members. It is important to regularly attend a church where you can fellowship with other believers. and members of God's household. ...We have the certainty of eternal life - living forever with our Father and our new family. ... The Christian has the Holy Spirit, who is God, living within him. He is the Christian's Guide, Teacher, Comforter and the One who shows him his sin. We need to fellowship with the Father and listen to the voice of the Holy Spirit each day by reading our Bibles. will teach you ll things. ... As Christians we can come at any time to Christ to ask for His forgiveness for our present sins and failures, and to ask His help in times of need. We need to spend time in prayer every day for these things.